Much has been written about Colonel John Stevens and the Stevens family in Hoboken. Stevens put Hoboken on the map by offering ferry service from New York to Hoboken where city dwellers could enjoy the fresh air of suburban New Jersey. In the late 1850s the North German Lloyd and Hamburg American steamship lines moved from Manhattan to Hoboken. The North German Lloyd sailed between "New York", Southampton and Bremen, Germany. The Hamburg America sailed between "New York", Southhampton and Hamburg. Over time other lines arrived in Hoboken, extending the waterfront. The two German steamship companies attracted a large German population. Adding to the city's growth was the arrival of the railroads starting in 1862. 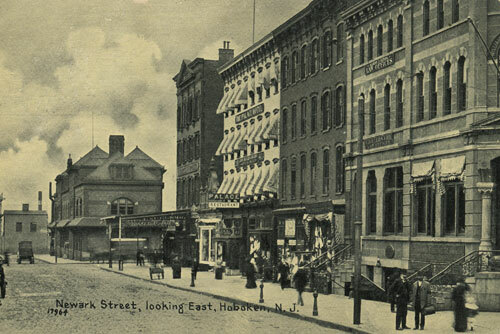 Hoboken became a major rail terminal for commerce between New York (and New England) and the mid west. 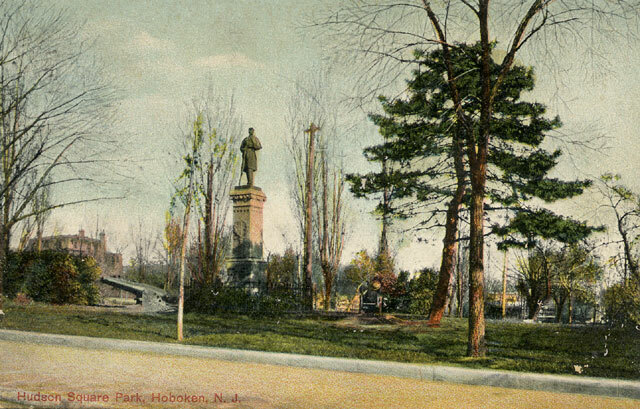 Hoboken was incorporated in 1855. 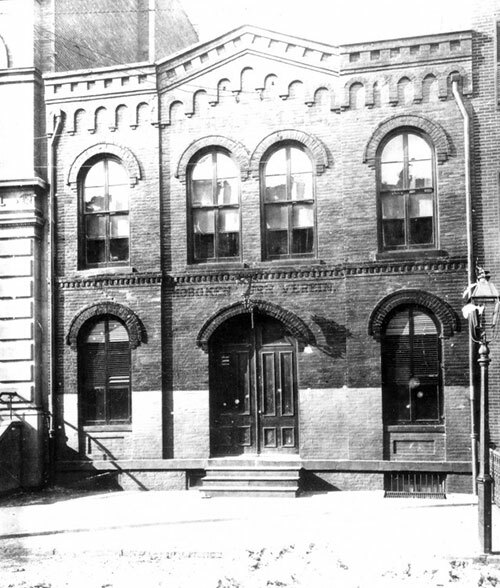 City Hall was completed in 1881. In 1891 a million dollars worth of new buildings were constructed. 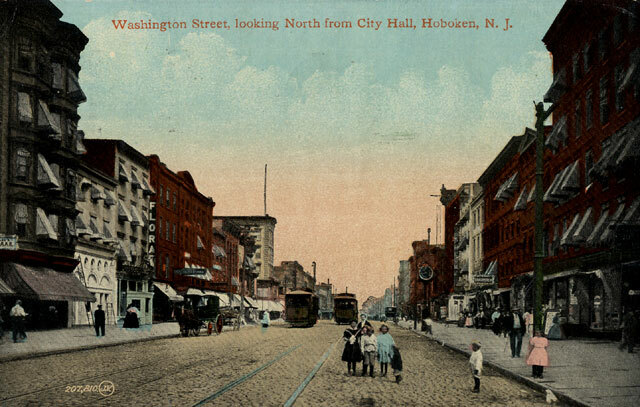 Hoboken was in its heyday between 1880 and 1910. It had a combination of affordable housing for workers and elegant housing for the well-to-do who liked the views of the New York skyline. "pop in 1850, 2,668; in 1860 9,662; in 1870, 20,297 of whom 10,334 were foreigners"
Hoboken had Irish, Italian and German enclaves. But it was perhaps the German culture that dominated until World War I. Hoboken was a center of German culture, with German Churches, beer halls, news papers, social clubs etc. 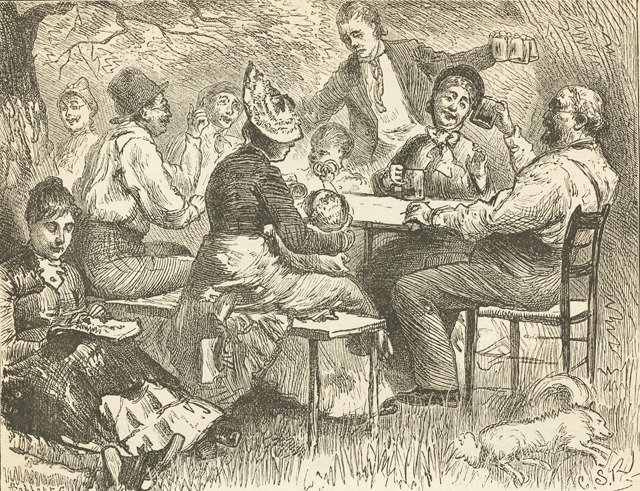 The large numbers of German immigrants living in Hoboken earned it the nickname of "Little Bremen". My ancestors, the Petermanns and Lands, lived in Hoboken. The Petermanns were in Hoboken from circa 1885 to about 1910. 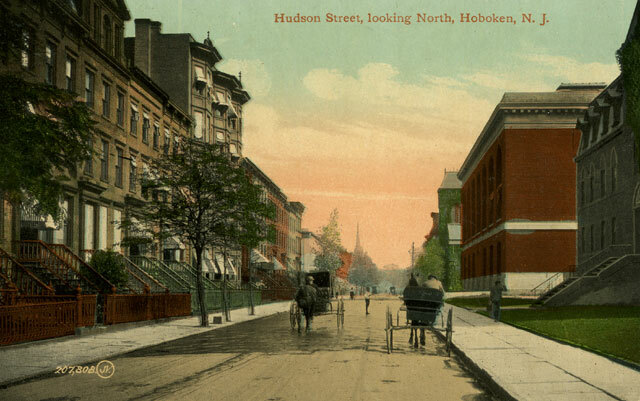 The Lands were in Hoboken from circa 1895 to 1897. Law Land and his son, Percy, returned for a short period of time in 1906/07. I believe they were working on the construction of the train station in 06/07. My husband, Tom's ancestors, the Blancks, Erxmeyers and Kettlers also lived in Hoboken. The Blancks and Erxmeyers arrived in the mid 1870s. Some Blanck and Erxmeyer family members were still there until the 1940s. The Kettlers arrived in the early 1890s. Some family members were still there in 1930. For many years no trains went directly into New York City. Trains coming from the south and west terminated in Jersey City or Hoboken. Passengers then transfered to ferries to make the final leg to the city. Christopher and Barclay Street Ferries Hoboken, N. J. Entrance on the left says: "Christopher Street Entrance for Teams". That on the right is the Barclay Street Entrance for teams and the central entrance is for passengers. The underwater railroad tunnel open February 25, 1908. The new "subway" line ran from Hoboken, New Jersey to 19th street and 6th Ave in Manhattan. By 1910 it had been extended to its present terminus at 33rd Street. 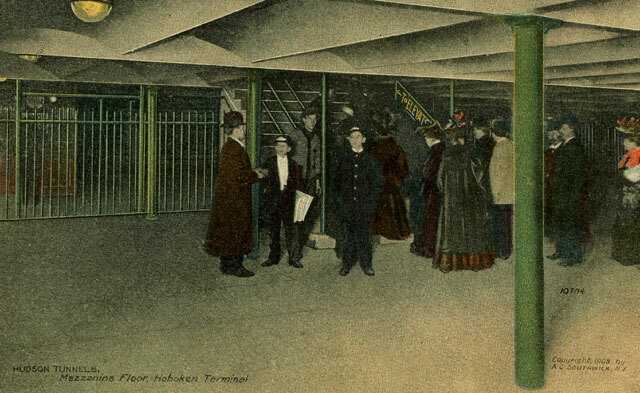 The tunnel to the brand new Hudson Terminal building on Church Street in Lower Manhattan opened in 1909. Other tunnels followed. They later became part of the PATH system. Bud Land said that his mother, Meta Peterman, and her sister, Annie, walked from Hoboken to New York in a tunnel before it opened to the public for use. They most likely walked through what is now the PATH tunnel. Hoboken was the New York City port for several steamship lines including the North German Lloyd, the Hamburg-American, the Netherland-American and Scandinavian. Hoboken fronts on the Hudson River accross from Manhattan. The Palisades, a line of steep cliffs which rise nearly vertically, seperate Hoboken from Jersey City and Union City (part of Union City was once called West Hoboken). Various cuts, tunnels, trestles, elevators, staircases, roads and inclines bridged the elevation. Many of them like the Ferry Street Trestle Hoboken, the Inclined Cable Railway and Hoboken Wagon Elevation are now gone. 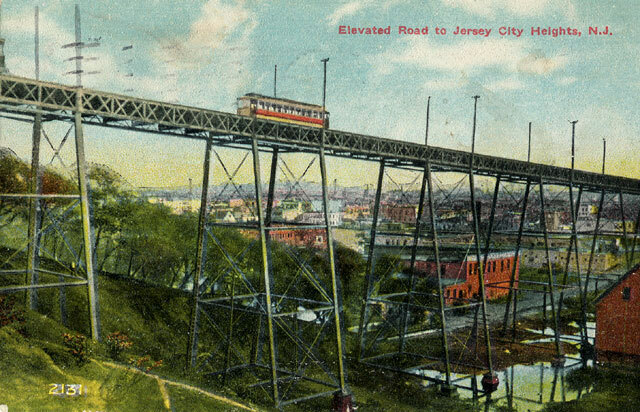 The Ferry Street railroad trestle was completed in 1886 and was a great improvement over the incline that hauled traffic up the palisades to Jersey City Heights. However the inclined remained in use for moving cargo for some period after the trestle was built. The streets from south to north are: Ferry, Newark, followed by 1st through 18th Streets. House numbers start in the 30s west of River Street. I believe that River Street was also called Fifth Avenue. See M Loewy postcards dated 1904 and 1905. The streets from east to west are: River, Hudson, Washington, Bloomfield, Garden, Park, Willow, Clinton, Grand, Adams, Jefferson, Madison, Monroe, Jackson, Harrison and Marshall. The Petermann Family lived for many years at 36 2nd Street (just west of River Street). The Lands lived at 213 14th street in 1897 (between Garden and Park). 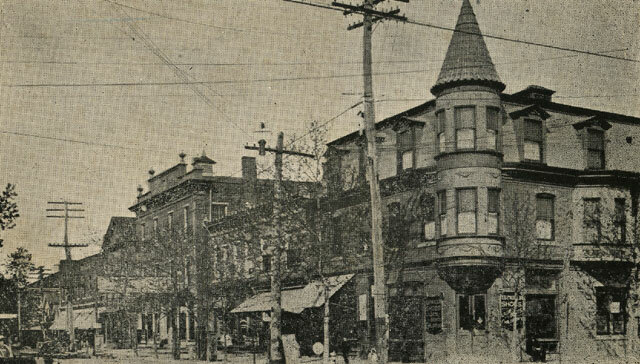 Fred Erxmeyer lived at 157 3rd Street in 1899 (between Bloomfield and Garden). Gertrude Kettler was at 253 3rd Street in 1907 (between Park and Willow). Known addresses for all of the connected families were no further west than Adams Street. The Blancks were living as far north as 11th Street by the 1940s. The Lands were at 14th Street in the 1890s. At that point 14th Street must have been fairly undeveloped compared with the rest of the town. Most of the other known addresses were concentrated between Ferry and 5th and River and Willow. Hudson Street looking North, Hoboken, N.J.
Stephen's buildings on the right and the spire of St Matthew's in the distance. Newark looking east, Hoboken, N. J. To see more images of the Newark Street click on the picture of Newark Street. Washington Street looking North from City Hall, Hoboken, N.J.
Washington was and is the main commercial street in Hoboken. On the left side of the street can been seen a sign for "Flora". While the name was listed in the 1910 census in Hoboken I could not find a family in business on Washington Street. The sign just beyond Flora is "Dental Parlor" followed by "Cigars". On the right side of the street the clock in the distance says a quarter to eleven. A little in front of that is a vertical sign "Orpheum". Further forward is a horizontal sign "Braunstein". The 1910 census which is VERY hard to read lists "Leonard" (?) Braunstein age 39, born Romania, dealer in (can't read) commercial store, his wife, Henrietta, age 25, and sons Roy (or Ray) age 6 and Walter age 4. They are listed in Ward 1. However, I cannot read the street address. The Braunstein family, "Ben" age 48 shopkeeper jewelry, Henrietta, age 34, Ray age 17 and Walter age 13 were in New Providence New Jersey in 1920. To see more images of the Washington Street click on the picture of Washington Street. 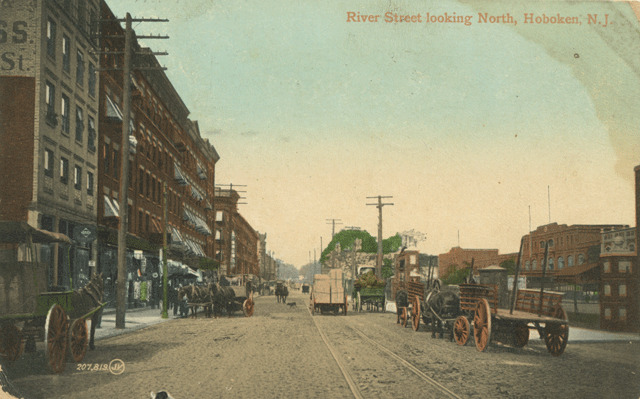 To see more images of the River Street click on the picture of River Street. 11th Street Looking West, Hoboken, N.J.
To see more images of other streets in Hoboken click on the picture of 11th Street. Hoboken as seen from the clock tower of the Train Terminal. Pleasure Cruises to all parts of the world. 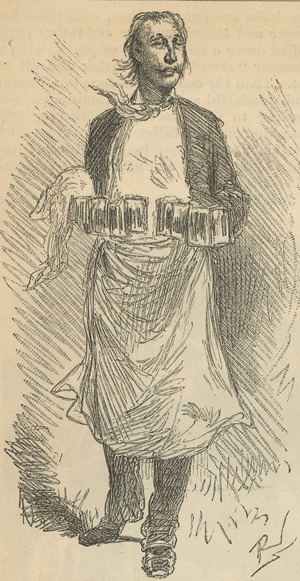 Frank Leslie's Illustrated Newspaper June 12, 1873 The 1880 Census shows Herman Busch age 50, hotel keeper, born Hanover, his wife Caroline age 34, Augusta daughter age 13, Caroline daughter age 9, Herman D son age 7, and a servant at 115 Hudson Street. Of the noted early firms in Hoboken was Keuffel and Esser a manufacturer of surveying instruments. 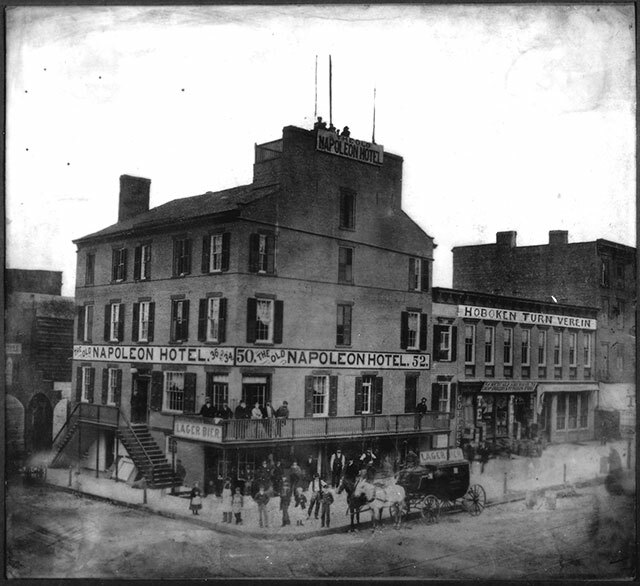 They were established in 1866 at Adams and Third Streets. The company originally imported precision engineering instruments. Subsequently they opened a factory in Hoboken. They were the first producers of the slide rules in the United States. John Blanck worked for K & E from the time he was a teenager until he was in his late 50s. K & E raised spiders in their basement to obtain filament for cross hairs in gun sites. 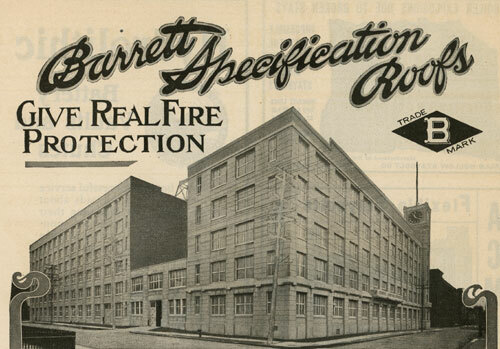 The K & E plant was destroyed by fire in 1906. The K & E operations moved to Morristown in the 1960s. From the Keuffel and Esser 1944 Catalog 40th edition. Bavarian Yodelers, Meyers Cellar, Hoboken, N. J. 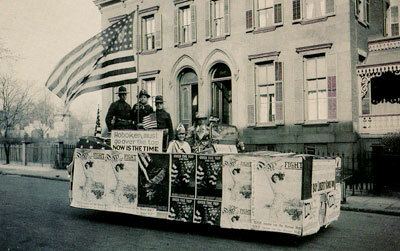 "Photo of World War One Hoboken parade float, River Street near Fifth. Donated by Lois Kruse Mohns. Her cousin, George Crawford, is shown standing far left. Photo circa 1917, R. Magnus, Hoboken, New Jersey. This card was billed as "Bellvue Ave, Hoboken" when I bought it online. However, there is nothing printed on the card. The notation "Bellvue Ave, Hoboken N. J. - Main Street" is lightly written in pencil on the back of the card. 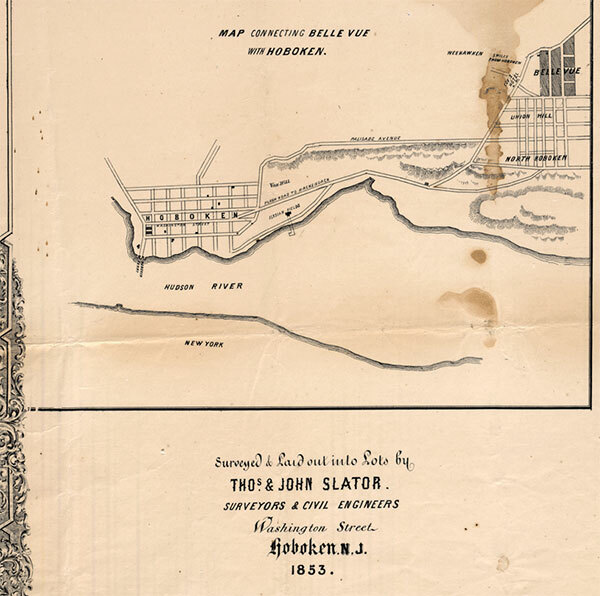 In December 2016 David Avery sent a copy of an 1853 map showing Bellvue west of Union Hill and North Hoboken. 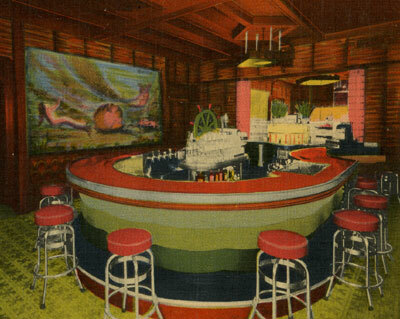 Meet me at the Continental Bar- It's Air Conditioned - Continental Hotel 101 Hudson Street, Hoboken, N. J. Posted 1943. 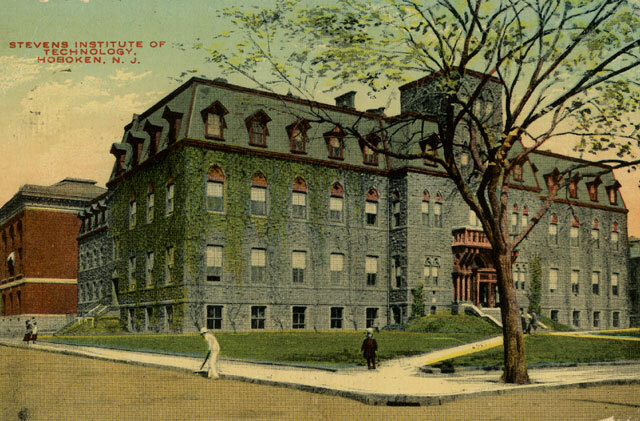 "II Academic, May 18, 1900, Hoboken Academy" handwritten on front. "E. F. WALTER 410 Washington Street Hoboken" stamped on back. The Hoboken Academy was at Willow and Fifth. "was founded in 1861 by German Americans who wanted to provide a German language and culture oriented education system for their children." German (Orthographie, Lesen, etc. ); English (Spelling, Reading, Grammar, etc. ); French; Latin; Arithmetic; American History; Geography; Gymnastics; and Needlework. The 45th anniversary of the Hoboken Academy closed with graduation exercises at the German club house. 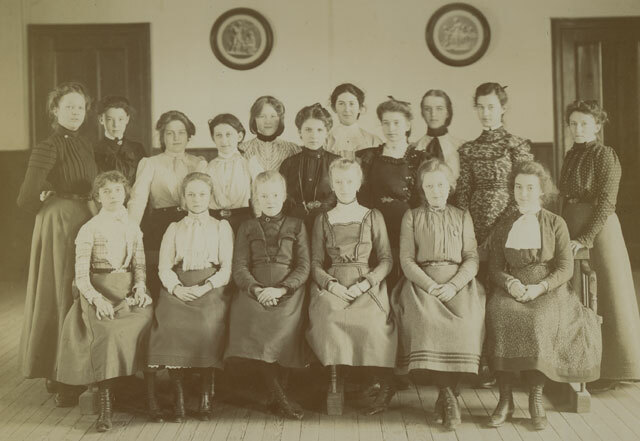 Graduates were: Gertrude Coly, Edward Fortnmann*, Gustav Freygang, Louise Gericke, Helen Gricsh, Anita Henning, Louisa Henning, Alice Junge, Anna Klie, Carl Krause, Alice Krusius, Elsa Tanner and Bruce Freile. *E H Fortmann, born July 8, 1889, a native of Hoboken and a graduate of the Hoboken Academy, became general manager of the National Transit Company, Oil City, Pa. and had been with the company for 26 years by June 1958. He was a graduate of Stevens Institute. Listed in the 1900 census in Union were: Anna M Forkman	50, 12 children 9 living, widow, Genese M Fortman	32, John M Fortman	30, Anna M Fortman	27, Bertha Fortman	25, Augusta Fortman	15, Albert Fortman	12, Edward Fortman	10, Elsa Fortman	7, Emma Fortman	22m no occupations for any of them. While I don't know which one of these lovely young ladies was Emma Ruhl the Censuses give some hints to her life. 1910: Emma was listed in the 1910 census with her father on Hudson Street as follows: Herman Ruhl head widow age 72, merchant import-export, Elsa daughter age 30 single stenographer, Thusnelda daughter age 28 and Emma daughter age 24 singer concerts. 1914: Miss Emma Ruhl of Hoboken was a member of a corps which raised the flag at Union Station in Washington in October 1914 by an order of Presiden Wilson. 1915: Passport applicationborn 16, Emma H. B. Ruhl, July 1888 Hoboken New Jersey, temporary sojourn in Munich left the USA April 25th 1912, lost her passport age 26, eyes blue, hair blond,"not able to prove identity but indubitably native born and expects birth certificate -- Germany at present a nurse at American Red Cross Hospital at Munich." 1920: Garden Street: Papa is gone, the household is Elsa age 31 stenographer office, Melda age 29 noon, and Emma age 27 soloist church, all getting younger as they are gettin older. 1930: Garden Street own home $4,000, Else age 47 and Thusnelda age 45. I bought this image on ebay and the seller said it came from an album that included images of Hoboken. The flags have 5 rows of stars which puts the date of the picture before 1890. After 1890 flags had six rows of stars. The stars are lined up one under the other - this could suggest the flag that was in use between 1877 and 1890. 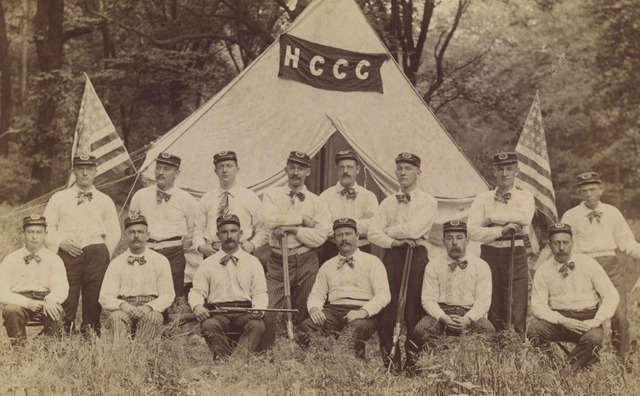 The insignias on the hats are "HCCC". The type of hat and rifles suggest Civil War Vets???? Americans Glad to Be Home - Awaiting Trains for Demobilization Camp, Hoboken. World War I started in 1914 as an armed conflict between France, Russian and the United Kingdom on the one side and German, Hungary, Turkey (Ottoman Empire) and Bulgaria on the other.The US tried to remain neutral but eventually entered the war in April 1917. 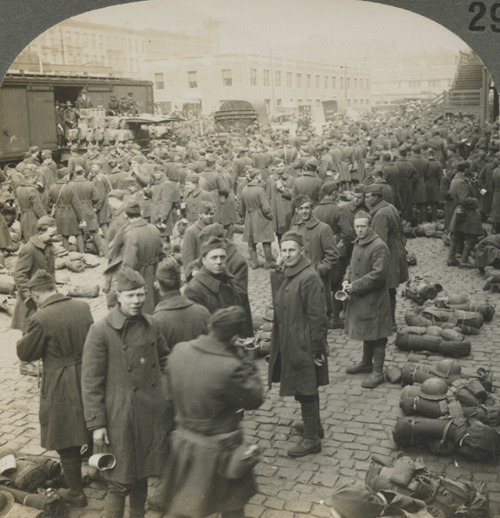 Almost 2 million soldiers were shipped out through Hoboken. Hoping for a speedy end to WWI General Pershing told the troops they would be in "Heaven, Hell or Hoboken" by Christmas 1917. The war did not end until November 1918. After the US entered the war there were significant issues for many German Americans. Many were looked upon with suspicion. German names of cities, streets, food, organization, businesses, theaters, etc. were changed. (Frankfurters became hot dogs.) German America schools were forced to close. 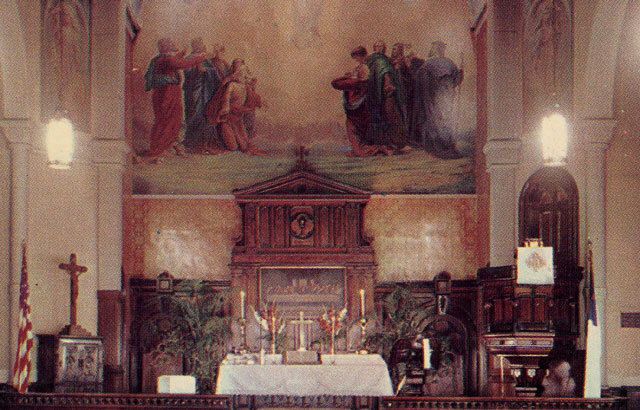 German was not allowed to be preached from the pulpit. German language newspapers were banned. German language books were burned by libraries. Many German Americans Americanized their names and ceased speaking German, even at home. 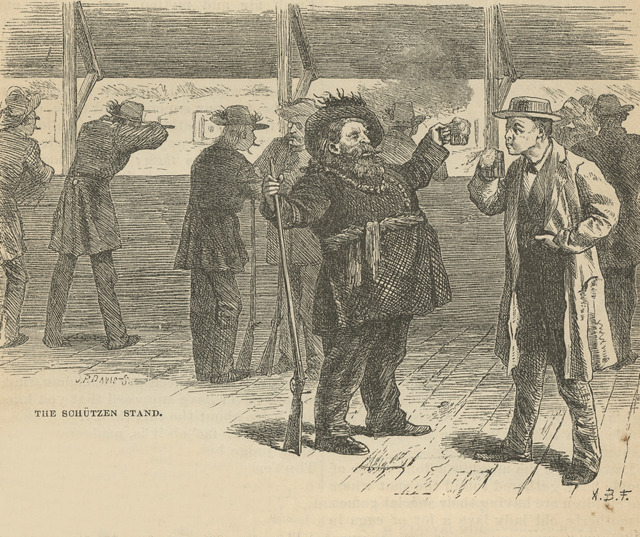 The federal government seized the German piers and shipping lines in Hoboken, closed most of the beer gardens and detained hundreds of Americans of German descent. The Hoboken Piers of the North German Lloyd Steamship Company burned in a huge fire on June 30, 1900. After the fire the company temporarily used piers in Brooklyn. By November 1900 they had decided to rebuild new steel piers in Hoboken. By April 1901 enough of the piers were in place for the North German Lloyd steamship, Grosser Kurfuerst, to dock in Hoboken. This was the first steamship to dock in Hoboken since the fire. 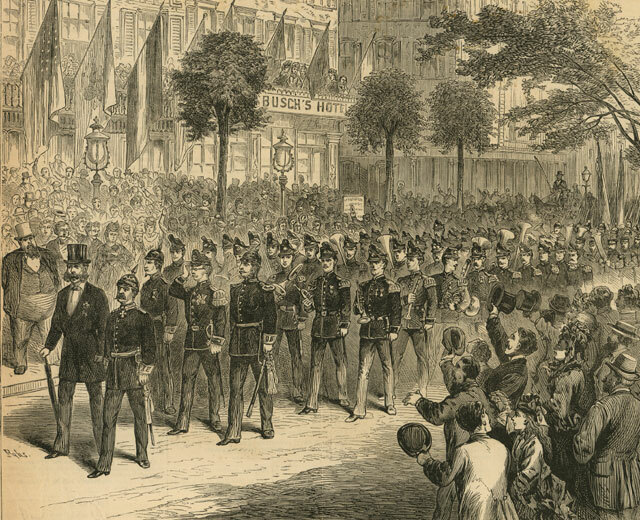 The arrival of Grosser Kurfuerst was greeted with great fanfare. The article from which these images were taken described the Schützen Park Canstätter Volksfest as a popular "Suabian" harvest festival. The writer took the Christopher Street Ferry from Manhattan to the Jersey side and then took the incline to the top of "Hoboken Heights" from there he went by horse-railway north and was "transferred from America and Yankee surroundings, to something much like an outlying suburb of Berlin or Bermen." "The first look of the place inside the gates suggests only an ordinary suburban beer garden — a pine-clad hillock, a few sheds with rude placards in Suabian German of inviting eatables and drinkables, and the chronic beer counter. But a few steps through the trees down the steep western slope brings us out into the clear, and we begin to see how pretty it all is. Right at our feet is a pretty little music temple, with a tolerable band playing lively airs, to the delight of the promenaders scattered along the broad, neatly kept gravel walk which runs nearly the length of the park, edged with flower beds and rustic seats, running off northward into rural plantations, and terminating at the southern end at the clubhouse of the Schultzen Verein, or Rifle Association — a solid, handsome building in dark stone, of castellated architecture and densely draped in ivy. Opposite the music temple, across the promenade, lies a group of buildings — a large restaurant, with bowling alley in the basement, and a great covered floor for dancing, crowded with the most motley assemblage of hilarious Teutons." Some of the younger girls and almost all of the little ones were dressed in typical German peasant costume "velvet or stuff bodice, chemisette, braided hair, queer black hoods, short colored skirts, and white stockings." Some men were dressed in "knee britches and wrinkled boots, long-shirted blue coats with bright buttons, and cocked hats". In the morning there had been processions, speeches, singing and "other social doings". "The base was banked with pumpkins and squashes and cabbages and melons and other ponderous and high-colored vegetables, artistically fitted in with a due regard to contrast of color, trimmed and mortised with layers of evergreen and great cool leaves, while at the fur corners stand great bouquets of natural flowers and grapes. The slender shaft is carried up with a variegated brilliant masonry of cucumbers, and tomatoes and apples and pears and peaches and similar ornamental fruit crowned by an imitation bronze statue of allegorical import." 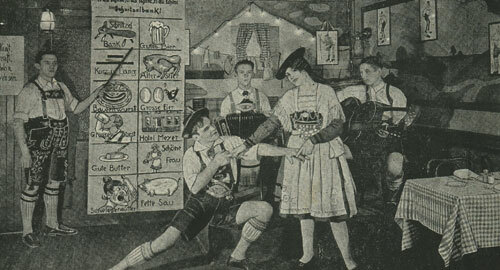 The meadow was lined with flag decorated booths selling beer, wine, wurstel sour-krout, potato pancakes, and other German delicacies. There were games for children and adults. The Schuetzen Park, was located in North Bergen. People came from all the German communities in the New York metropolitan area - Jersey City, Hoboken, Brooklyn, New York City. It still exists in an altered form at Kennedy Blvd and the Hackensack Plank Road. There were Schuetzen Parks or "shooting park" all across the United States wherever there was a sizable German-American population. Baltimore, Md., Davenport, Iowa, Philadelphia and Pittsburgh had Schuetzen parks. The parks contained target ranges for rifle marksmen. In addition many Schuetzen parks had places to eat, drink, dance and bowl. Favorite foods were wurst, sauerkraut, kummerl, Schweitzerkase, kuchen. Lager beer was the most popular drink. The property for Schuetzen Park in North Bergen was purchased by the Plattduetsche Volksfest Verein club in 1894. Clubs like the Plattduetsche Volksfest Verein were originally organized as insurance clubs where people paid a bit each week and then when someone got sick or died the club would assist the family. Such clubs were popular in many ethnic groups. 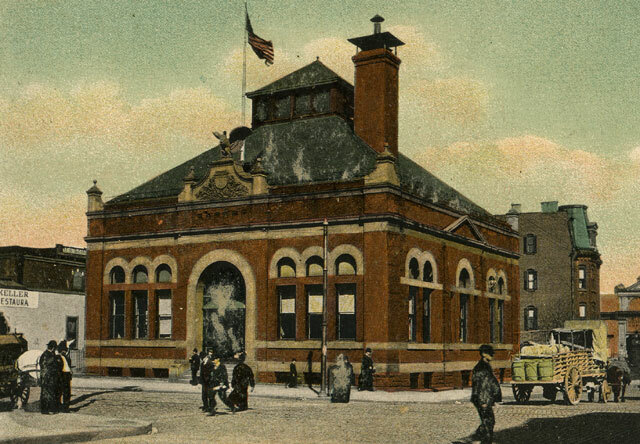 The Hoboken Turn Verein was one of the oldest gymnastic and athletic societies in New Jersey. Several branches of the Land/Blancks lived in Hoboken. Tom Blanck was born in Hoboken where his father's ancestors, the Blancks, Erxmeyers, and Kettlers had settled. Meta Petermann, was born in Hoboken where she met her husband, Percy Land, whose family had lived for a while in Hoboken. The Erxmeyers arrived in Hoboken in the late 1860s or early 1870s. Henry Blanck arrived in Hoboken circa 1870. Fritz Kettler immigrated from Germany circa 1883. After a brief stop in Brooklyn the Kettler family moved to Hoboken circa 1890. The Petermann family also immigrated from Germany circa 1883. They also stopped first in Brooklyn, moving to Hoboken circa 1885. The Land family, who were originally from England, moved to Hoboken, via Detroit, Michigan and Toronto, Canada, in the mid 1890s. 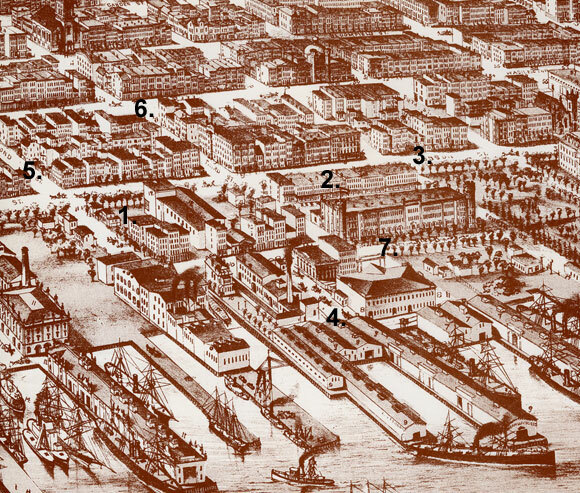 Much of Hoboken's economy was tied to the waterfront. In the late 19th century Hoboken became the New York port for several steamship companies and had one of the most thriving wharfs in the New York Harbor. Two German steamship companies, the Hamburg-American (Hamburg Amerikanische Packetfahrt Actien Gessellschaft, or HAPAG founded in 1847) and the North German Lloyd (Norddutscher Lloyd, or NGL founded in 1858), were established in Hoboken in 1863. The Hamburg-American line with 55 ships had their piers at the foot of 1st Street and was known for its service between New York and Hamburg, Germany. The North German Lloyd line with 14 ships had their piers at the foot of 3rd Street and was known for its tri-weekly service between New York and Bremen, Germany. These lines brought large numbers of Germans immigrants into Hoboken and by the 1890s about a quarter of Hoboken's population was German. The Netherlands-American Line (later the Holland American line) was established in 1872 with a pier at the foot of 5th Street and service was between Rotterdam and New York. The Thingvalla Steamship Company (later the Scandinavian Line) was organized in 1879 running service between Copenhagen and New York. Their dock was at the foot of 4th Street. By 1880 the Wilson Line, running service to England and consisting of eight steamers, was between Second and Third Streets. A 1906 map of Hoboken shows the Tietjen and Lang Dry-Docks between 16 and 18th Streets. Importing and exporting made Hoboken an important warehousing and wholesaling center. In the early years, the cargo to Europe was livestock and the cargo to America was people. Larger ship held form 1,500 to 2,000 passengers. An average steerage ticket cost $30.00. The largest ships could make $60,000 on a single voyage. 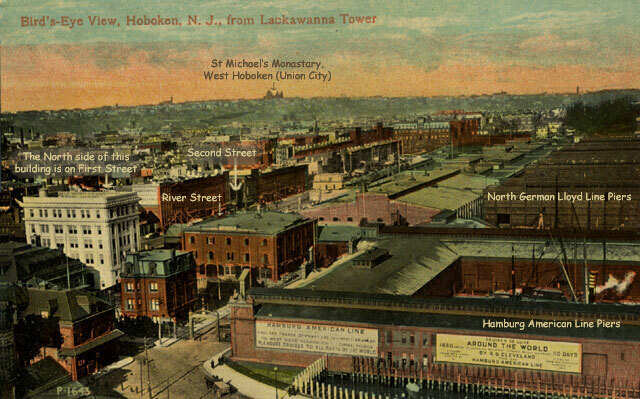 Hoboken was also the terminal for the Delaware, Lackawanna and Western Railroads and the Hoboken Shore Railroad. It was an important point of embarkation for arriving immigrants and much of Hoboken's economy was tied to the steamship companies and the waterfront. The Lackawanna Train and Ferry terminal was at the southernmost end of the city with the steamship company piers stretching to the north. The northern end of the city was not as well developed as the southern end. The area to the east and closer to the water was developed before the western part of the city. The Blancks, Erxmeyers, Kettlers and Petermanns all initially lived in the southeastern section. The Lands lived in the northeastern section. However, when Law and Percy returned to Hoboken to work after 1900 they stayed in the southeastern part of town. The southern part of the water front from Ferry Street to 4th Street was pretty much taken up with piers and the train/ferry terminal so the local residences did not get to see the water unless they took a ferry or worked on the docks. There was a restaurant in the train station with windows facing the water and summer eating outside on an awning covered balcony. It was one of the few spots where one could see the water and it was a popular eating place until it closed during WWII. 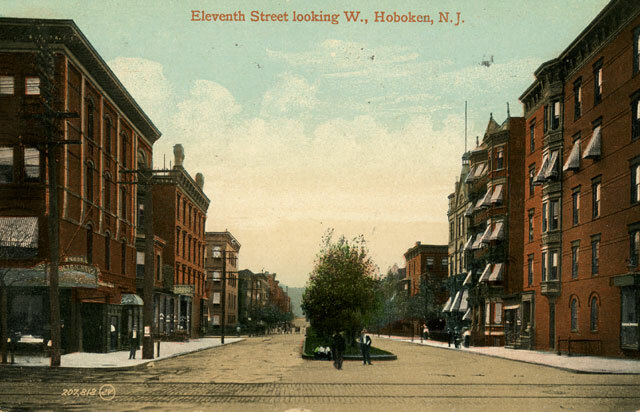 Hoboken underwent a great period of growth between 1880 and 1920 that corresponds to the general period of urban growth in the United States. 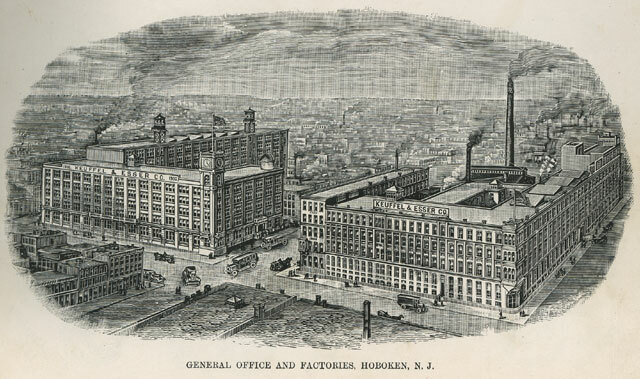 The number of manufacturing industries in Hoboken increased from 121 in 1879 to 399 in 1899. Most of the concerns were small, with most firms employing less than 20 people. 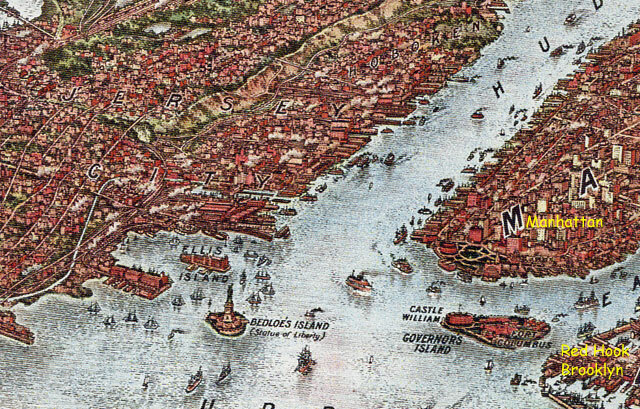 By the mid 1800s there were 7,000 people in Hoboken. More than 1,500 of there were German. According to the Supervisor's Report for the 1905 New Jersey Census: Hoboken had 65,468 inhabitants. 40,716 were born in American, 835 were born in England, 3,574 were born in Ireland, 10,322 were born in Germany, 4,964 were born in Italy and 5,057 were born in other countries. Number of dwellings 4,227. Number of families 14,656. The population of Hoboken in 1915 was 67,611. There were 15,322 families living in 4,511 dwellings. 41,610 were American born. The Germans was the highest foreign born group with 8,062 followed by the Italians with 7,328. As expected in a town where the docks were a major source of income, males outnumbered females: 35,102 males and 32,509 females.